Rosebud Economic Development Corporation (REDCO) builds Homegrown Prosperity by connecting Sicangu Lakota Oyate communities to local, traditional food. From left to right, the Sicangu Food Sovereignty Initiative Staff, Aaron Mandell, Mike Prate, Edwin Her Many Horses, Rachel Kent, Matt Wilson and Hollis Vanderlinden in front of a greenhouse at the Keya Wakpala Garden, in South Central South Dakota, on the Rosebud Reservation. Matt Wilson sports a “Star Wars” t-shirt and a deep turquoise beanie as he pulls up a chair to join his colleagues Aaron Mandell, Hollis Vanderlinden, Rachel Kent, and Edwin Her Many Horses. They gather around a table inside their new office space. The team works together to revive the Rosebud Reservation’s sovereignty and prosperity by way of food. Located in South Central South Dakota, the Rosebud Reservation is home to approximately 34,000 members of the Sicangu Lakota Oyate (“Burnt Thigh Nation”), also known as the Rosebud Sioux Tribe. Originally chartered in 1999, the tribe created the Rosebud Economic Development Corporation (REDCO) as a way to separate business from politics. As the economic arm of the Tribe, REDCO’s purpose is to generate revenue and create economic opportunity for the Sicangu Lakota Oyate. This purpose is realized in four synergistic ways: through business enterprises, community development, policy creation, and talent development. 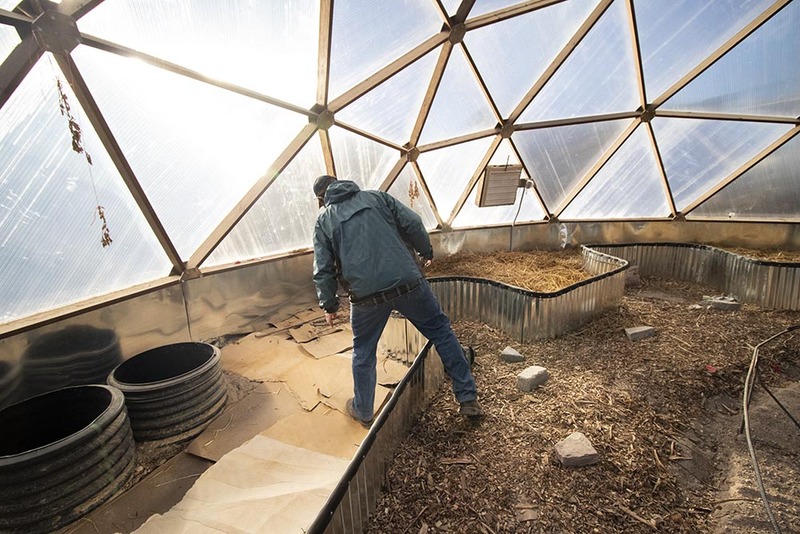 The Sicangu Food Sovereignty Initiative Staff, Matt Wilson, Rachel Kent, Aaron Mandell, Edwin Her Many Horses, and Hollis Vanderlinden in the greenhouse at the Keya Wakpala Garden, in South Central South Dakota, on the Rosebud Reservation. REDCO has created projects such as the Keya Wakpala Waiçageyapi (Wa-e-cha-gee-ya-pee), a sustainable, affordable housing project, the Tatanka Fund, an emerging Native Community Development Financial Institution (NCDFI), and the Sicangu Food Sovereignty Initiative. As their flagship program, the Sicangu Food Sovereignty Initiative started in 2016 in an effort to give food back to the Sicangu Lakota. Since its inception, the Food Sovereignty Initiative has helped local communities reconnect with healthy food sources. 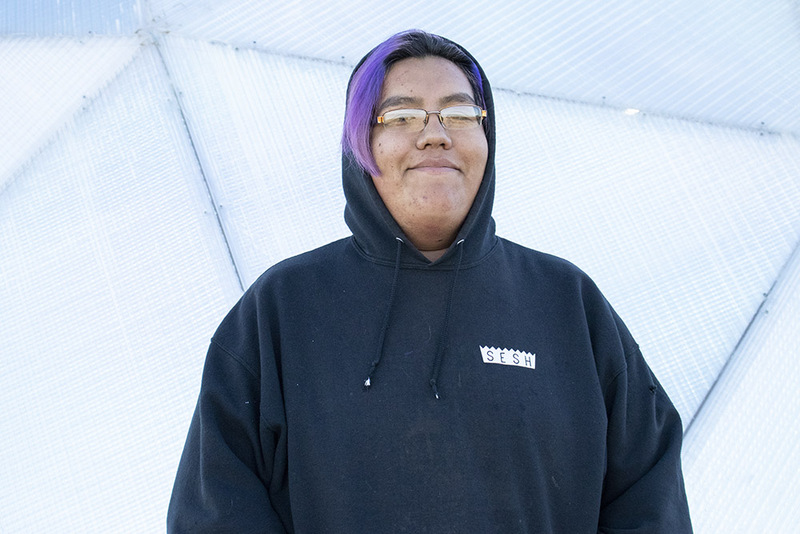 Growing up on Rosebud, Matt witnessed many regenerative and developmental groups come in with the goal of helping the Sicangu Lakota Oyate, only to abandon his community. Matt graduated from Todd County High School in 2010. He joined the Food Sovereignty Initiative last year after returning home from Arizona where he worked in education with the Navajo Nation. 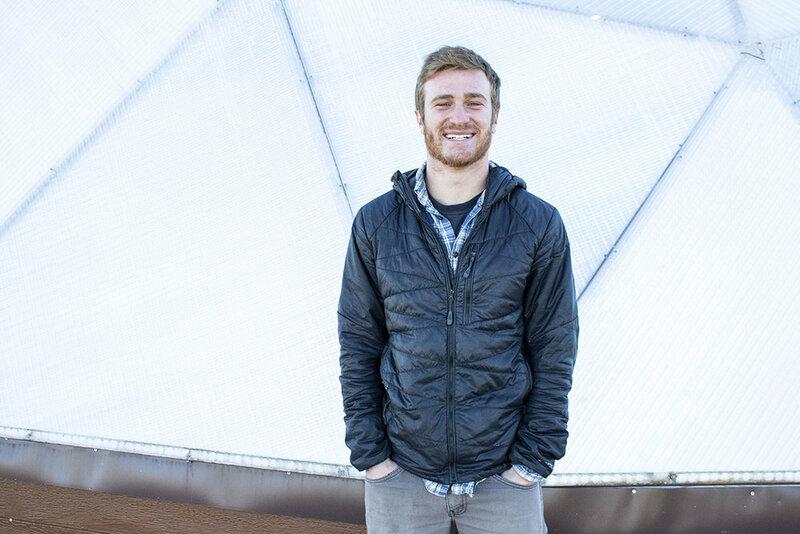 Similar to his colleagues, Matt works for the Food Sovereignty Initiative through AmeriCorps VISTA, a service program intended to better communities. Health statistics prove the need for emphasis on human health and food development. The mortality rate of Native people compared to non-native people is staggering. Indian Country has the shortest life expectancy in the U.S., as well as highest rates of heart disease, diabetes, chronic lower-respiratory disease, influenza, hypertension disorder, and cirrhosis. A destructive series of policy initiatives like the Dawes Act also known as the General Allotment Act (an act intended to break up reservations into individual property ownership in an effort to destroy tribal governments and Native culture through forced individualism, Christianity, property ownership, and European-style agricultural systems and methods upon Native persons), combined with forced relocation onto reservations left Native communities struggling to secure access to wholesome food systems. For those who resisted forced relocation, this struggle was amplified by the mass killing of the buffalo, yet another tool for subjugating tribes through food access restraints. “Access to food was the first thing attacked in an attempt to remove Native people from the land ... if you think about the history of food systems on Reservations throughout the US, you can get a sense of how important food really is,” said REDCO Food Sovereignty Director REDCO Mike Prate. The Sicangu Food Sovereignty Initiative is unique because it was created by the Lakota people for the Lakota people. Mike Prate inside the Keya Wakpala Garden’s greenhouse. But, the term food sovereignty is also subject to the interpretation of each community. Mike says the definition needs to reflect the needs and wants of the community equally with the ability to feed themselves. Since its start, the Food Sovereignty Initiative has created specific projects on the Rosebud Reservation to promote the health of the mind and body. The most influential project, The Keya Wakpala Garden, a one-acre teaching and production community garden, grows everything from peppers to pumpkins. This program teaches people about where their food comes from and how to grow it themselves. The Food Sovereignty Initiative also partners with local, educational organizations to teach youth about their traditional foods. Staff conducts buffalo harvests with local schools and also collaborates with the Boys and Girls’ club to host wild food harvesting and weekly cooking classes. Finally, their seasonal farmers’ market continues to be Rosebud’s only farmers’ market and is a hub for local vendors to sell produce, meat, and crafts. Each of these initiatives aim to provide the Rosebud community with wholesome food. Edwin Her Many Horses grew up about 100 miles west on the Pine Ridge Reservation. Edwin had never been involved in any type of food work prior to joining the team in 2017, but after a cousin who had worked for REDCO mentioned it to him, he decided to give it a try. Edwin Her Many Horses at the Keya Wakpala Garden, in South Central South Dakota, on the Rosebud Reservation. “I’m excited to come to work every single day,” Edwin says. Aaron Mandell echoed that sentiment about the work that REDCO does. He joined the team just over a year ago as an AmeriCorps VISTA. “This is the most fulfilling job I’ve ever had,” Aaron says. AmeriCorps VISTA member Aaron Mandell at the Keya Wakpala Garden, in South Central South Dakota, on the Rosebud Reservation. The connection between community and REDCO staff really started with consistency. REDCO’s initiatives are taking a different approach, which starts with listening. Staff listen to what community members want to grow in their gardens, what they want to cook, and what traditional food they want to pass on to their children through cooking classes. This approach fosters prosperity built by the community and staff simply aid in accomplishing the work. The Food Sovereignty Initiative staff has made a point of being visible in all 20 communities that make up the Rosebud Reservation and having an open dialogue with citizens. Rachel Kent says building trust has to do with visibility and transparency. 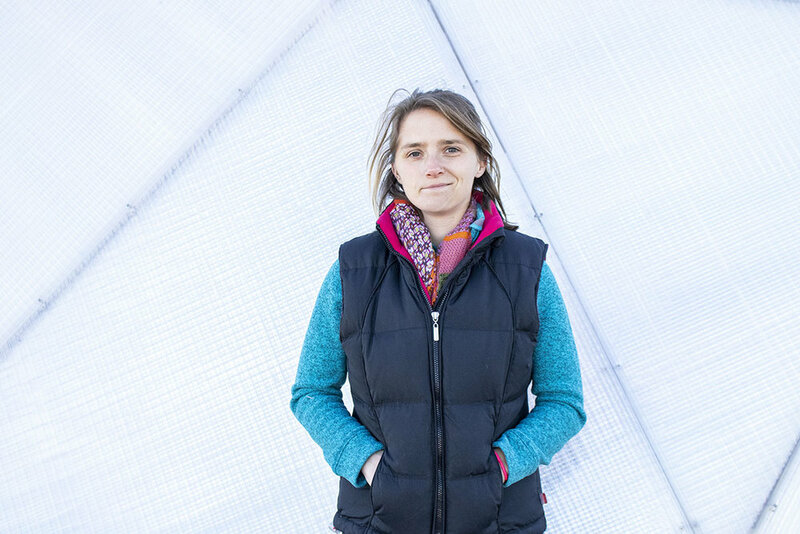 “We're trying to go to more events and community gatherings and community meetings, we want to be seen in the community and be up front with why we’re here and what we’re doing,” says Rachel. Rachel Kent at the Keya Wakpala Garden, in South Central South Dakota, on the Rosebud Reservation. Matt adds that consistency is another key part of building trust with the community. “I think consistency is really important and making sure that we show up — we show up again and again as long as we're welcomed and people want us here,” Matt says. One thing that makes food sovereignty work tricky is that each community on the Rosebud Reservation presents its own challenges. The work that the Food Sovereignty Initiative staff does has one goal, empower the Sicangu Lakota to create and utilize sustainable, traditional, value-based food systems in the way communities want them. The Keya Wakpala Garden, a one-acre teaching and production community garden, on the Rosebud Reservation. Working for the Food Sovereignty Initiative comes with the responsibility to consider all aspects of rebuilding a food system. For the staff, the bond they have with the community makes all of their hard work and long hours more than worth it. AmeriCorps VISTA member Hollis Vanderlinden at the Keya Wakpala Garden, in South Central South Dakota, on the Rosebud Reservation.